Yes, it’s true: The Polyphonic Spree is releasing a new studio album only a mere six years after the release of The Fragile Army. Tim DeLaughter and his ever-evolving, fifteen-piece ensemble have proven that they still have what it takes to make a refreshing harmonious explosion of pure delight all while staying true to the psychedelic-symphonic pop/rock sound that have been paramount to Polyphonic Spree albums of yore.I’ve had the pleasure of seeing the band a few times on their current tour, and hearing several of their new tracks live. The upbeat melodies and catchy hooks are still ever present, but Yes: It’s True features a more developed and refined sound. 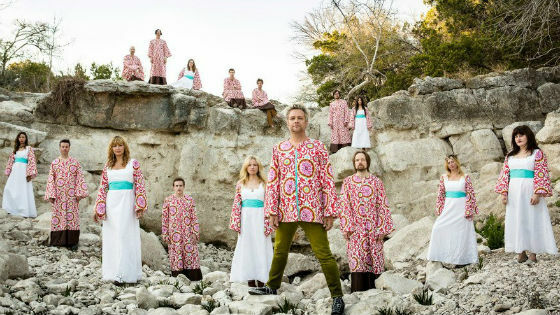 Like a fine wine, The Polyphonic Spree is only getting better with age! I can’t stop listening to this album. It’s quickly becoming my new go to daily soundtrack for life. The lyrics make you reflect, the new sound makes you stir. Do yourself a favor and pick up Yes: It’s True on August 6th, your heart and soul will thank you.Yes: It’s True track listing:1. You Don’t Know Me2. Popular By Design**3. Hold Yourself Up4. Carefully Try5. You’re Golden*6. Heart Talk7. Blurry Up The Lines8. Let Them Be9. Raise Your Head10. What Would You Do?11. Battlefield*Personal favorite off of the new album… best lyric ever… “It’s not the car that you drive, it’s not your phone with an “I”, it’s not your Facebook likes, it’s not your Instagram pride”. **This song will be in your head, indefinitely. Lucky for you, it’s a fantastically catchy tune worthy of the repeat button on your iPod.